If you are looking for the most popular running apps, they are Endomondo, Runkeeper, and iSmoothRun. These apps are most popular because they can measure your performance and track it without you having to buy a dedicated GPS running watch. Read on to find what each app offers. Endomondo offers lots of activity tracking beyond running and cycling as it can track over 40 activities besides running. The app is most popular in Europe, but can be used with any Android or iOS system wherever you are. 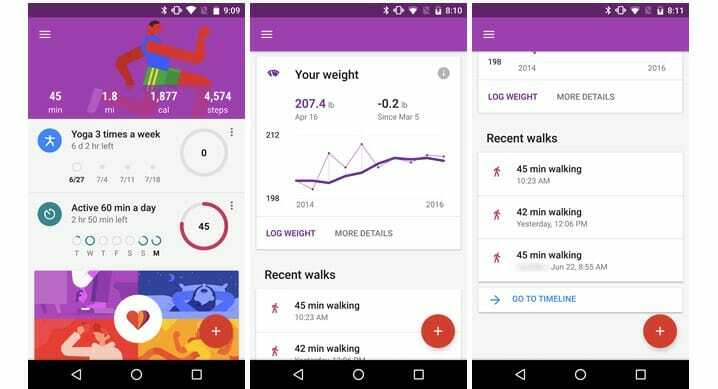 It supports Google Fit, MyFitnessPal, Samsung Gear, and Android Wear. The app offers a free version but premium members get more access to training and coaching plans. The app tracks distance, calories burned, and displays the route on the map. If you upgrade to the premium, you can also schedule exercises, set goals, and get feedback from an audio coach. The training plans vary, so you can choose what works best for you. For example, you may want to run further or faster. Whichever you choose, the app will customize a plan for you by starting at your fitness level. If you wear a heart rate monitor, you will get data on your heart rate as well. For the premium users, you can see how much time you spent in different heart rate zones, which is important for those looking to advance their training. There is a social aspect to Endomondo where you can compare progress to others and send or receive pep talks. 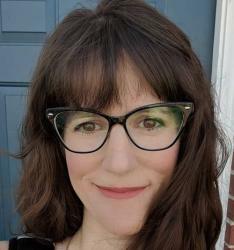 In addition, you can swap running selfies and connect with the running community. Once you pick an activity, the coach will guide you through it and then analyze your performance metrics once you are complete. The app is basically a virtual accountability partner that offers deep insights into your progress and helps you reach your goals. Do you not have a GPS watch but still want to track your data? Runkeeper is an app that does not require a wearable. However, it can be used with Garmin watches, Android Wear, and other Bluetooth wearables if you already own one. The app is simple and straightforward to use. Some training plans are free but others require payment. The premium version offers more detailed data, personalized training plans, as well as more insights on progress. The free version provides you with basic stats such as calories burned, exercise time, pace, distance, etc. 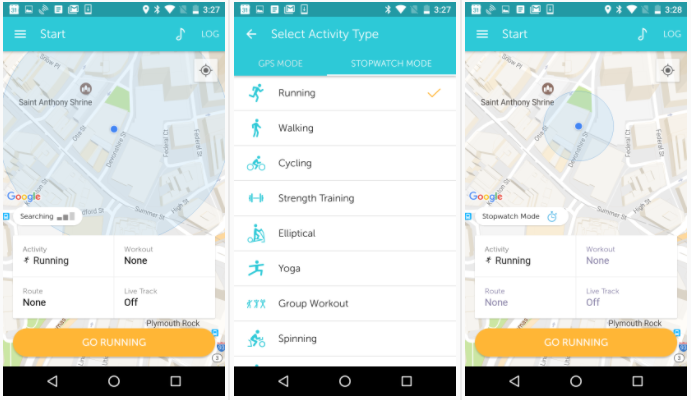 In addition to running, the app tracks cycling, hiking, and distance activities. You can run your own trail or follow popular routes, the latter of which is nice if you are running in a new area. Before you leave, you can pre-plan the route so you know just where you are going and don’t have to worry about getting lost. The premium version does have the more advanced stuff and fun stuff, like integrating the app with Spotify. There is real-time audio guidance so you can listen to Spotify while still hearing the audio cues. The app blends the two so your music is not completely interrupted but you can still hear the cues. A “DJ” in the app analyzes the music on your phone and plays tracks to match your speed. The training plans are designed by fitness professionals. You can choose certain goals and the app will create a plan based on what you need. Goals can include losing weight, running a half-marathon, or running certain distances. As you go along, the app adjusts workouts to suit your fitness level and mood. 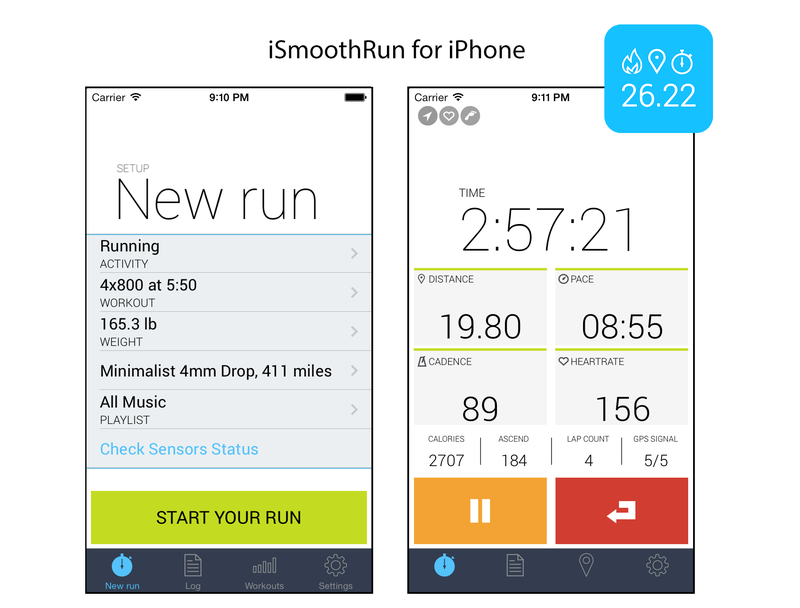 iSmoothRun has lots of details and features without being a cluttered app. It tracks speed, pace, distance, cadence, time, maximum heart rate, climb, interval stats, and splits. From your data, you can see graphs of your heart rate, altitude, cadence, etc. 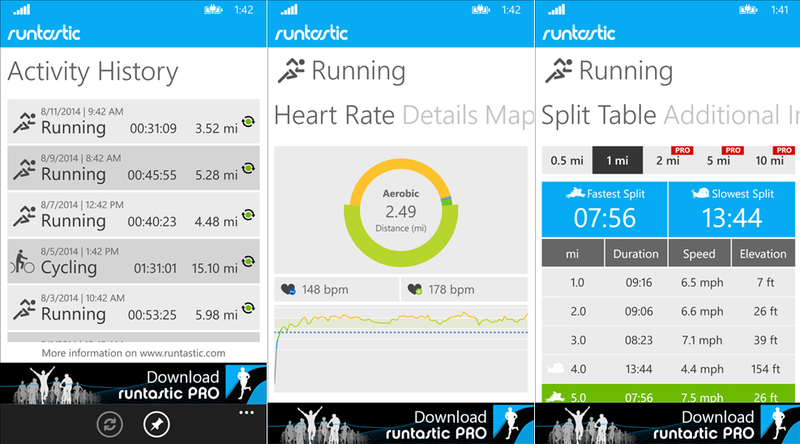 The app itself was created by runners and used by coaches and runners alike. If you are a serious runner, this app is a good option. Besides running, the app logs cycling, hiking, walking, and other fitness activities. It works well with the Apple Watch and your data can be exported to just about any platform. The data can be shared on social media as well. Training plans are available on the app and come with audio cues for coaching. If you prefer, you can use a footpod instead of a GPS watch, but both will work with this app as long as it is running off iOS. Shoe mileage can also be tracked with this app which is nice so you know when it is time for a new pair of running shoes. Interval workouts can be customized and the app features a metronome as well. This is helpful if you want to set your cadence and work on your overall form. If you prefer, you can race against yourself and see how you progress each time you race. The data from each run should sync automatically to most third party apps. Do you thrive on competition and love sharing your stats with runners near and far? Strava, Pumatrac, and RaceRunner are excellent apps for runners who excel on the social and competitive aspect of running. Strava is designed for social and competitive runners because you can see how your running performance stacks up against others in your area. The app even gives you weekly and monthly rankings that you can compare to other runners. While using the app, you can find local races, running clubs, and running guides. In addition, you can compete against other people while tracking the distance traveled, time and course taken, and running speed. The app also tracks elevation gained, which is a capability some others do not have. The advanced analytics and goal tracking is only available in the premium paid version. 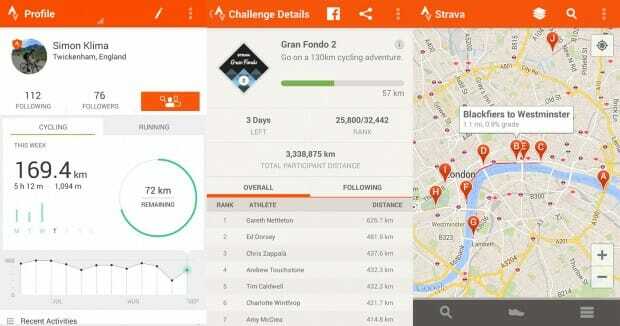 This app is a good option for those who like competition and the social aspect of running. However, if you are a more private person and likes to control what is shared, there are better running app options available. Overall, this app will provide you with detailed information on your performance, challenge your friends, leaderboards, and achievements along the way. Pumatrac offers the basic tracking tools, along with more details when you run, such as the weather, time of day, etc. After collecting the details, the app then creates a run score to give you the quality of your run. Basically the app can provide insights based on your running behavior. It learns about you the more you use it to provide a more holistic view of your workouts. The interface is clutter-free and is a minimalist style, which makes it simple to use. This also means the app won’t bog down your system and drain your battery. Besides running, the app tracks over 30 fitness activities and automatically pauses when you stop moving. Your Spotify playlists can be accessed through the app so you can listen to your favorite workout songs as well. 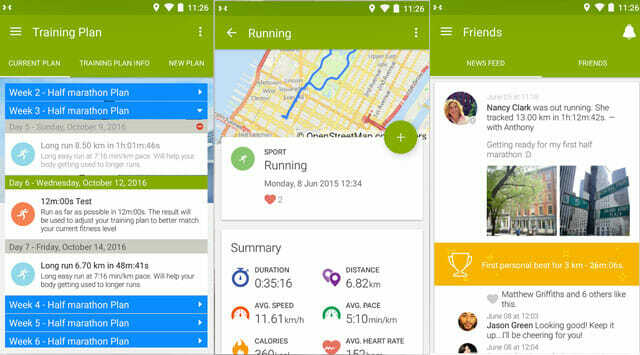 A social news feed is built-in to the app to connect with runners around you. An internal leaderboard offers competition with other runners and real-time insights. If you want, you can run through routes of other runners in your area and compare times. There is also a sharing option for all of your favorite social networks. The app also rewards runners that are most active. No matter where or how much you run, you will receive key insights from the app. One downside is the GPS can have accuracy issues at times. RaceRunner aims to make running more run by adding features like Free Run and Buddy Run. If you like the competitive aspect of running, this is a good option. You can race people around the world in real-time, which is pretty cool. You can invite your friends to races, wait for one, or start your own. The app tracks your progress globally so you can see how you stand out against runners around the world. 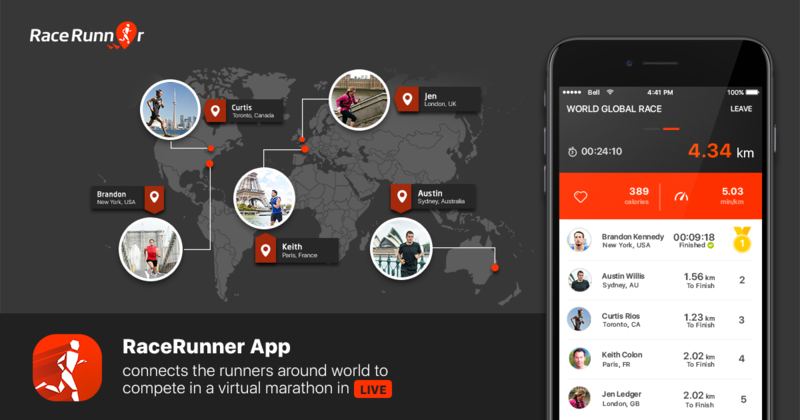 The app aims to bring runners together in a friendly competitive nature to help each one improve. When racing, there are voice prompts about what position you are in and how you are doing on time. It also tells you how close or far you are from the person in front of you. Every run you do also provides you with points. These points can be turned in for rewards once you have enough points to redeem them. Besides racing, the app tracks your progress as you run. It has the traditional run tracker and will log your stats. The app also allows you to complete time trial runs without having to connect your phone. This app is good if you want to push yourself and race against others. It is not an app to rely on all the time because realistically not all runners run races all the time, so it can get a bit tiring, which is where other apps come in. Just starting out to run or are a beginner runner? There’s an app for that. Nike+, Google Fit, and Runtastic are good choices if you need a little guidance and motivation along the way. 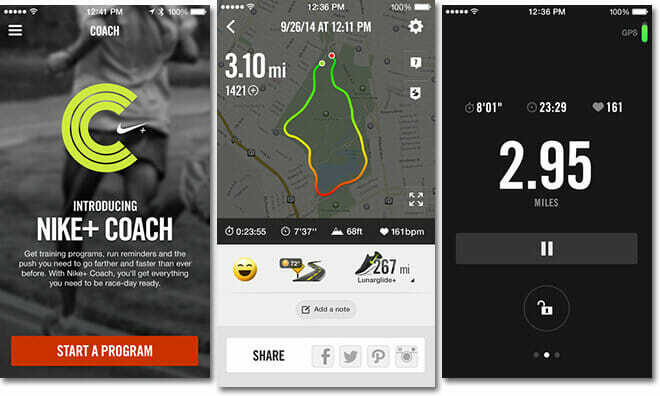 Nike+ has an easy to use layout that offers achievements and training plans. The app is available on Android and iOS phones, but not on Android Wear smartwatches at the moment. This is something to keep in mind when deciding between apps. In the beginning, Nike+ was designed for beginners or those returning to running after taking a break. The exercises will help you improve strength, endurance, and speed. The app offers coaching plans and adapts your fitness goals to the progress you are making. If you need motivation while you are running, the app offers cheers, which is similar to Endomondo has been offering over the years. If you set on the Cheers in the app, Nike posts to Facebook that you are heading out for a run and when people “like” or comment on your post, you will hear it on your run. The My Coach training plan offers a framework for those just starting out. For example, there is a Get Started training plan that is four weeks long. If you are looking for something to build a little more endurance, there is also an eight-week training plan. Plans are also available by distance, from a 5K all the way up to a marathon. My Coach tailors to you by asking you a set of questions before setting your training schedule so you have a more customized plan. The app has gamified options and a “Power Song” for when you need an extra boost. There is even encouragement from Nike’s pro athletes. You can also set what you are running on, such as sidewalks, trails, treadmill, etc. The app offers a music player and social networking so you can share your progress. In addition, you can also share stickers, photos, and other running related fun with others on the app. One downside to this app is you cannot take your data with you. When you sign up, you sign away your data in the user agreement, which means if you change apps, all the data you stored on Nike+ will be gone. Google Fit has a nice clean interface and supports most wearables. It is free and good for beginners. The app tracks exercise, calories, and uses charts to show your progress. While you are running, the app tracks speed, route, pace, and elevation. Sleep tracking is available on this app as well. There is no way to measure your heart rate unless you wear a smartwatch or a device that syncs to Google Fit. However, most smartwatches do sync and are compatible, just be sure to double check everything is synched before you head out on your first run. The app offers personalized recommendations based on your goals and data. These recommendations are then used to help boost your stamina and performance. The app can take information from Strava, Runkeeper, Nike+, and wearables and put them all together so your health and fitness data is in one app. One downside to this app is it doesn’t provide route suggestions. Runtastic can be used for running, but with the Pro version ($4.99) you also can track snowboarding, skiing, biking, kayaking, and loads of other fitness activities. If you purchase the pro version, there are still add-ons in the app, such as additional training programs, that can be purchased separately. The app uses GPS to track and map exercises and if you link the app to Google Earth, you can see your run in Google Earth, which is pretty neat. This is also nice for when you are running in an unfamiliar area or a new city. 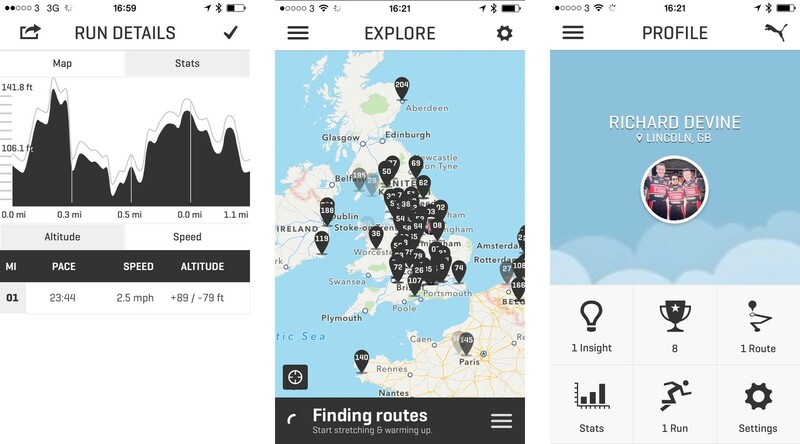 The app monitors time, distance, speed, and plots your route in real-time. The metrics are tracked so you can view them when you are done running. The information appears in graphs that you can share over social media if you prefer. If you listen to Spotify or Pandora, the app syncs with either of these services so you can stream music right from Runtastic. If you like podcast style tracks, you can download them at $1 a piece, and they last about 35 to 40 minutes. Besides tracking the basics, the app also tracks your mood, the weather, what type of surface you run on, your heart rate, etc. When you combine everything together, you get a great amount of comprehensive data. Goals can be set by calories or by distance, depending on what you prefer. There is an auto pause if you stop to take a breath. The stats are detailed and you can review all of your information in monthly charts. Are you serious about weight loss and want an app that incorporates running and diet plans? Running for Weight Loss is the perfect option because it is an all-in-one app to help you on your weight loss journey. Running for Weight loss is a running coach, fitness log, and a diet aid all in one. The app offers training plans such as running for weight loss and training for a 5k or 10k. The premium version offers more music, training plans, a coaching option, and removes ads. If you have been trying to lose weight and need a plan to get started with running, this app is a good option. The app tracks the basics like distance, pace, calories, etc. while being very easy to use. There is no long setup, just press a button and you are ready to go. You can link it FitBit, MapMyRun, RunKeeper, or many other popular apps to help keep you on track. The diet plan is designed to increase the effectiveness of the workouts and has healthy recipes. You can also create a personalized diet plan. The goal of the app is to help you lose weight gradually while building up stamina. Along the way, you will have inspirational quotes and a simple plan to follow. This app is best for beginners or those who want interval training. The intervals can get predictable once you figure out the pattern, so that is one downside. Another downside is the app does use quite a bit of battery. While this is not technically a phone app, it is a desktop app that can hold all the information from your other apps. If you want detailed information and visualize your data in one easy location, Smashrun is a good option. 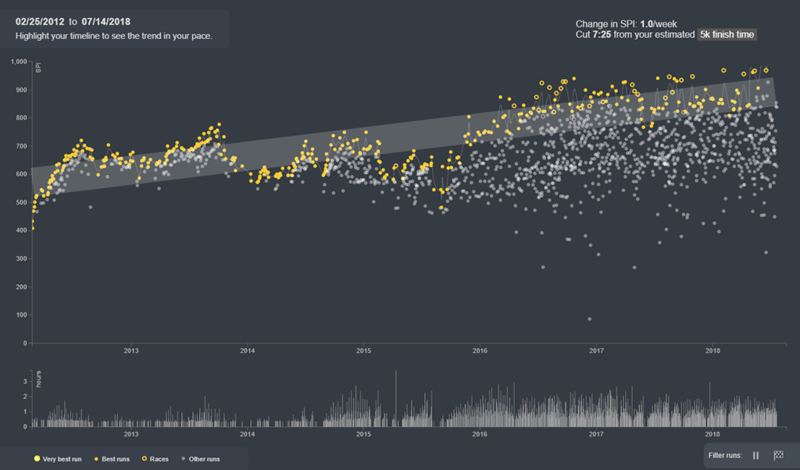 Smashrun is a desktop app that provides detailed analytics and visualization of your data over time. It is free to join and uses a gamify system for motivation. For example, you can earn badges as you go along. Smashrun syncs with many training apps and wearables. If you prefer, or happen to forget your watch on a run, you can manually import your data via GPX, HRM, or TCX file. Once the data is imported and synced, Smashrun will analyze it and provide you with detailed analytics. It is free to join, which is a big plus. If you decide to switch up your running apps over time, Smashrun keeps your data and syncs it with the new app. You won’t have to worry about losing your the data from the previous app. This app is a good way to log all of your running information in one place and visualize how you have improved over time. How come Garmin Connect is not mentioned; its got all of the above and more plus it’s free.